Now how many of you all have heard of the brand E.L.F? Anybody? Now if you're not raising your hand at this point, you ought to be ashamed! I'm kidding. You have deprived yourself of something great though. E.L.F, which stands for "Eyes Lips Face," is an affordable brand of makeup and face products. 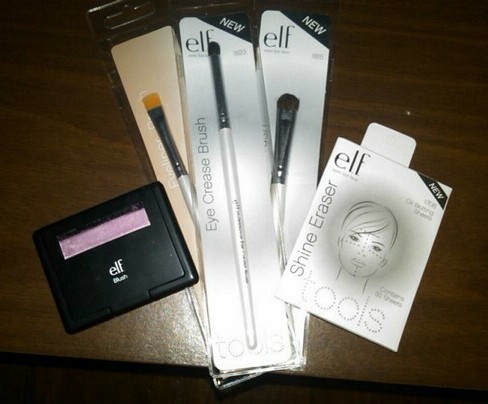 I first discovered E.L.F a few years ago at a local Dollar General. I bought a simple eyeshadow brush for a $1. I didn't know how awesome this brush would be until I tried it out. Their brushes are professional quality. Can you imagine a $1 brush working just as well as a $20 brush from MAC? Think about it! I bet not, but it's true! I decided to try a couple more of their products. Check out E.L.F right now! They usually have awesome offers such as 50% off brushes OR free shipping! Can't shop online? Check out your local Dollar General or Costco. Enjoy!